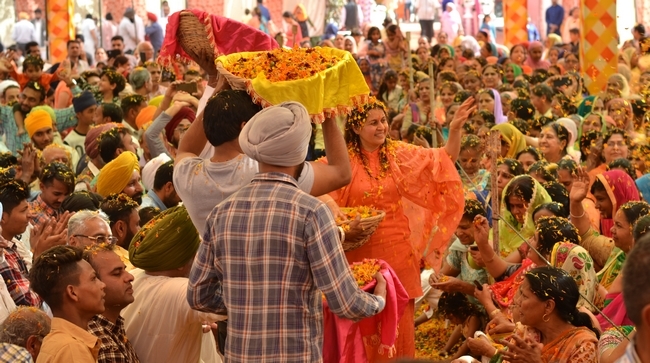 21 March 2019, Naad Jagaran Kendra, Maloya, Chandigarh: Once again, it was the time for the grand musical Holi celebrated with delightful flowers instead those of water and colors. While addressing the gathering, Sadhvi ji shared the concept in stored in the celebration of the festivals altogether plus Holi in particular. Let us too collect the divine message! It is true that kaliyugi bodies lack the ability to perform rigorous practices as compared to those from the other ages. Therefore, due to excessive grossness in the Kalayugi bodies, our saints and sages initiated the celebration of festivals such as Holi and others so that we could stay connected with our goal, which is self-realization or being one with the ‘One’. How; Guru Sahib has placed a very beautiful and simple solution in front of us i.e. chanting His divine name day in & day out. In this context, we have Mira Bai as an exemplary example who was born and brought up in palaces and was the queen of Mewar. She left the society and its prudence behind, turning worldly limiting endearment to pure and complete love. And therefore the Sushumna Path, also known as the Agni (fire) Path got opened and respectively the divine nectar from Sahasraar made its way up to the very follicles of the body resulting in the oneness of Mahyogini Meera and Lord Krishna due to the transformation of the gross body into an immortal one. 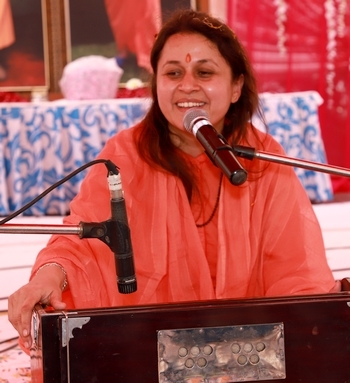 Often when it is suggested by saints to take some time out for a dive deep within, then we put forth excuses such as, ‘we do not have the time.’ Now assuming that our child is weak in studies; we put him up for some extra classes so as to cover the possible gap somewhere. Similarly, if we truly believe that our goal is the realization of the divine, the supreme happiness and so far that goal has not been achieved then this implies we do need some extra classes to get over that shortcoming. Here, by extra classes we mean extra time should be devoted to the respective necessary practices observing diligence coupled with patience. Why because, once we get colored in the divine color of Lord’s name, it is guaranteed to stay forever.